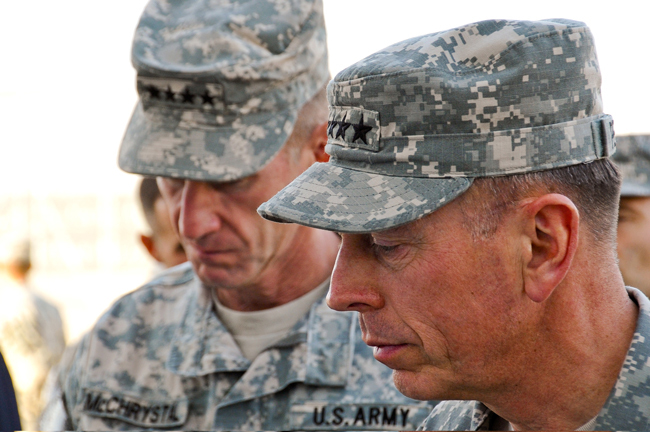 Petraeus takes command and the dust settles, now what was McChrystal thinking? We may never know what drove Gen. Stanley McChrystal to say the things he did to Rolling Stone. But now that the dust has settled we should closely analyze McChrystal’s misstep for hints or suggestions as to what he was really trying to tell us. By now everyone knows that McChrystal made the fatal mistake of criticizing the civilian chain of command, and for that President Obama accepted his resignation. McChrystal clearly erred in sharing that he felt that the President was intimidated by his own generals and implying that the Vice-President didn’t have a handle on the Afghan war, and he undoubtedly knows this. But were his comments regarding senior civilians not in his chain of command meant as a warning? Military officers are taught from day one to place the care of the men and women under their command first. McChrystal’s comments hint of man who personally felt that the civilian apparatus was too broken to adequate address the task at hand. McChrystal is a smart man, and one who spent his career under the radar. In this highly unorthodox move he broadcast his frustration publicly and openly. Only the General really knows why, but it is not outside the realm of possibility that he chose to make a statement that things are not going quite right in Afghanistan. Perhaps he felt his strategy did not receive adequate support at home, or that even the best military and civilian minds are struggling to frame a policy to fit the conditions. There is no real evidence to support the idea that McChrystal purposely ended his career. Some have even suggested that he and his staff didn’t realize the comments were on the record. But because it looks increasingly likely that these comments were on the record, and because of his commitment and sacrifice for the country, I don’t think it is a waste to continue the conversation as to why his career ended the way it did.